Location: Sited well back from Lloyd George Avenue beyond adjoining warehouses, formerly on N quayside of Bute West Dock (now filled in). N front visible from Herbert Street at bridge over dock feeder. On map of 1849. 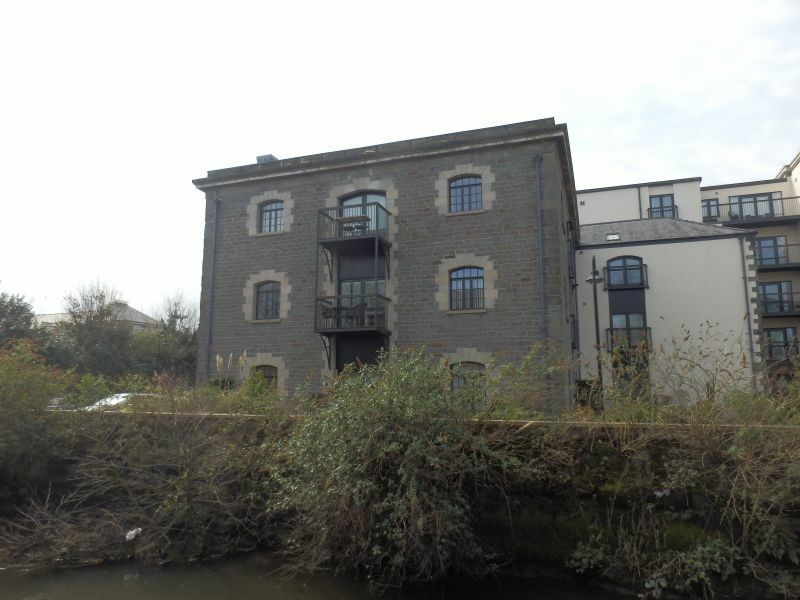 Earliest surviving dock warehouse in Cardiff.Built (and probably designed) by William Catleugh, millwright and iron founder of the Hayes, Cardiff. Later used as a bonded warehouse. Square 3 storey and basement. 3-bay warehouse with coursed hammer-dressed facing. Low pyramidal slate roof behind ashlar blocking course and heavy cornice; small chimney stack. Full height loading bay to centre with boarded and corrugated shutters on three level, brackets for pulley hoists over. Cambered heads to flanking windows with 20-pane ironwork frames (now blocked). Similar N front with boarded doors retains fine ironwork bracket crane with pulley; small enclosed yard. Retains original construction with three-aisled ground floor over fireproof basement. Cast-iron, fish bellied and crossed-flanged piers with annulets; cross-plate ends curved. Embossed lettering on piers reeds; "W. Catleugh. Millright, Cardiff". Cast iron handrail to corner stairs down to basement with brick Jack Arches and inverted T-profile girders supported by longditudinal girders with piers as before. Stone flagged floor. Timber upper floors and pyramidal timber roof of king post construction central support. Brick linings to upper floors only. Sited on corner of Lloyd George Avenue and Herbert Street, formerly on N quayside of Bute West Dock, (now filled in). To S of junction with Herbert Street. Crosses Junction canal to E of right-angle bend. Carrying the railway to Bute Road over the Dock Feeder at a skewed angle, immediately S of the main line; beside an industrial estate. On S of Callaghan Square. On a small, square site, to N of St Mary's Church. Set back to W of Bute Street from which it is reached via North Church Street. Presbytery to the front. Crosses former Junction Canal to W of Spillers and Bakers.